Build and write-up by Brittany Doran. Hey guys, its Britt! 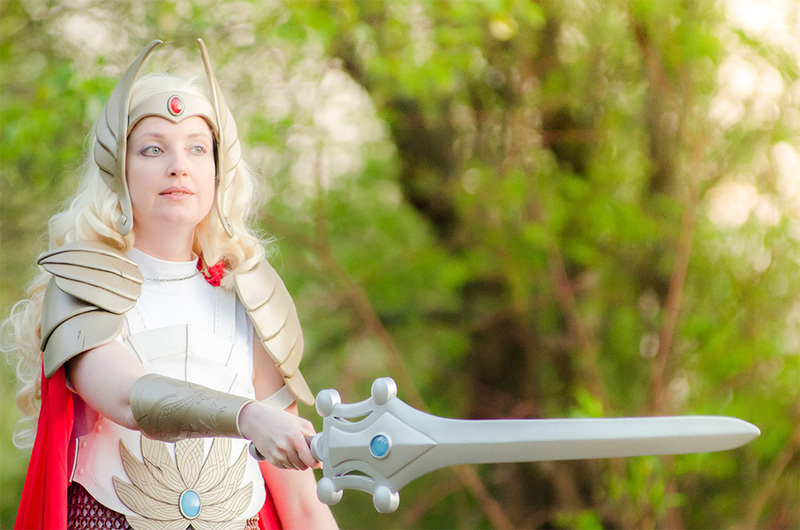 Here’s how I made my EVA foam armor She-Ra cosplay! 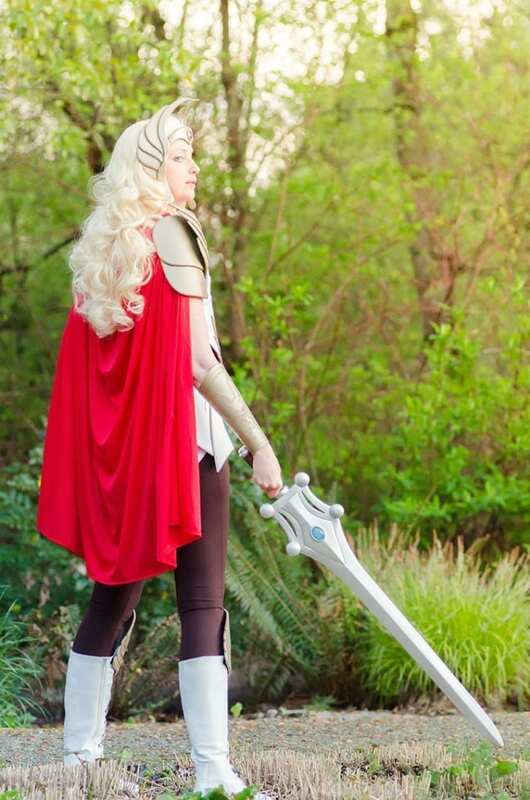 I grew up watching She-Ra cartoons and I always loved the character. 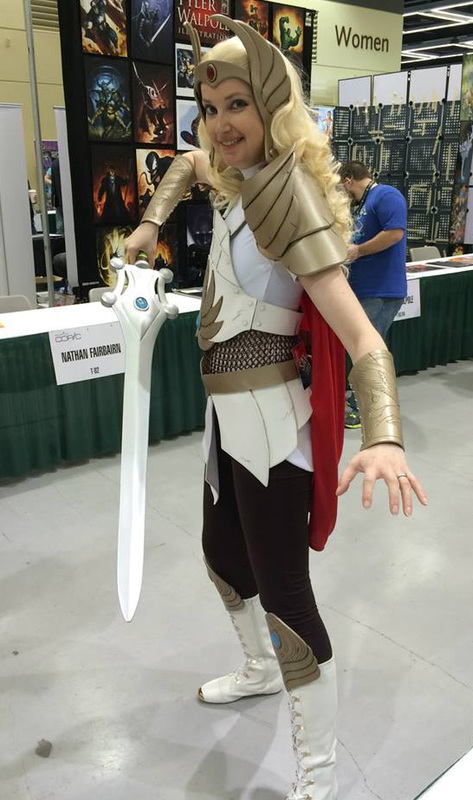 Lately, I’ve seen some amazing Wonder Woman costumes where the cosplayers add awesome armor pieces. I was inspired by this to make a battle armor version of She-Ra. After gathering reference images, I sketched out some ideas. Bill helped me make a bracer template from my forearm. We wrapped my arm in plastic wrap, then added duct tape. After marking where the seam lines should go, Bill cut the template off my arm. I then laid the template on a cutting mat and took a picture to use in Inkscape. I created a vector file and printed it out on normal paper to check the scale on my arm. Around this time, Bill finally got a laser cutter!!! 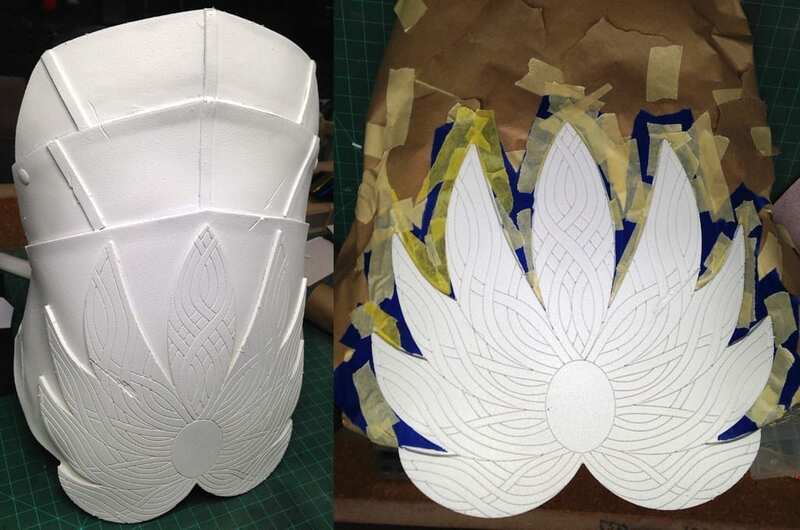 There are many materials that can’t, or shouldn’t, be laser cut, but EVA foam can! (As long as you have the proper ventilation.) We did some small tests and discovered the right speed and only used 1% power to engrave 3mm craft foam. Inspired by this useful tool, I drew a vector of Swift Wind for the bracers. Even at 1% power, the engraving almost went all the way through the 3mm craft foam. 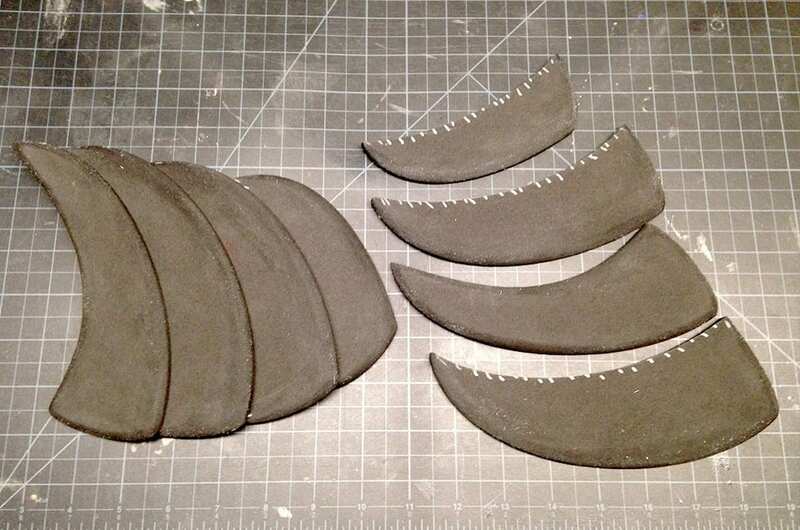 I brushed Barge onto thin, non-stretchy cloth and the backs of the bracers. 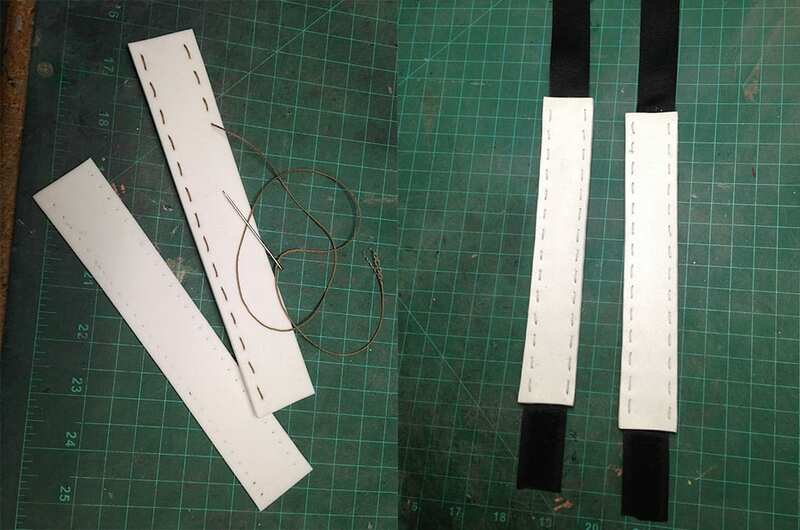 After sticking the two materials together, I cut out the cloth and had sturdier versions of the bracers! 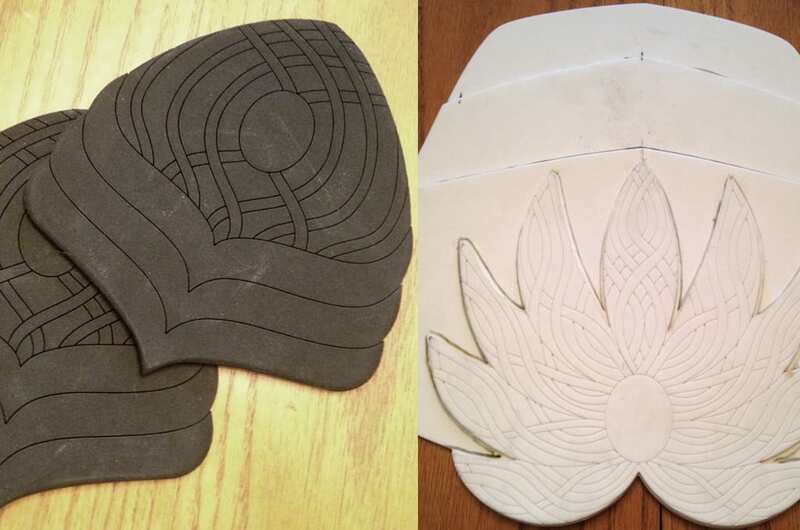 I did the same vector and laser process with the boot tops and chest piece. 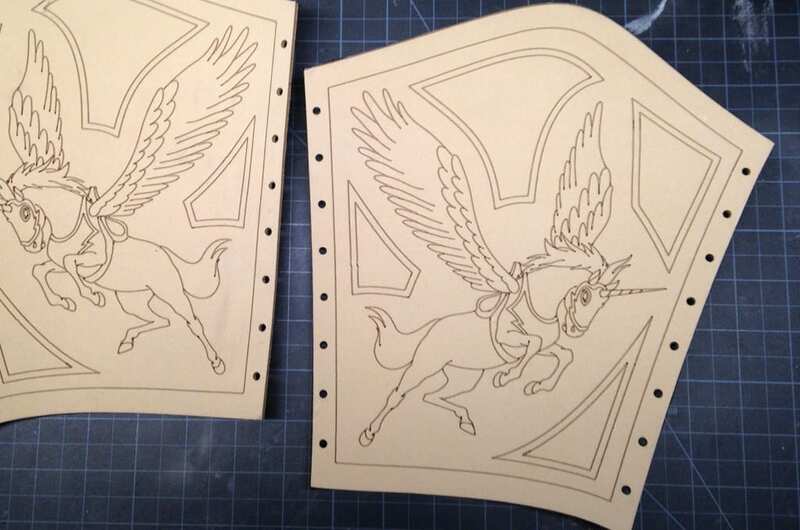 The boot tops are 6mm craft foam, so we tested the laser settings again to get a good cut. 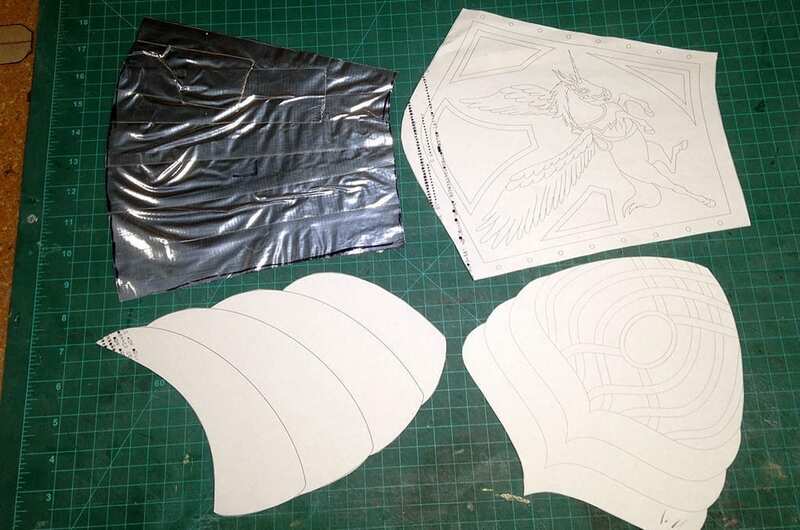 I always made sure to test the size of each piece by printing the templates on normal paper, cutting them out and taping them together before using the laser. The chest piece got some flat thumb tacks added to look like rivets or some kind of “attachment”. The joint is really held on the inside by a nylon webbing strap. 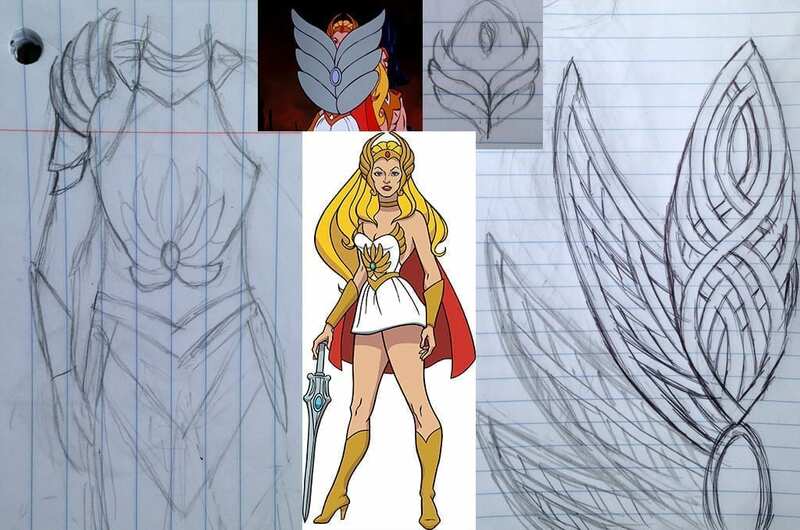 I wanted to keep She-Ra’s wingaling crown design close to the original. I made a template, then cut out the wing pieces a little bigger where the seams would overlap. I used 6mm foam and sanded the edge with a Dremel and a sanding disc bit, then sanded with 220 grit sandpaper to get a curved bevel. I used Barge to glue the pieces together. The structure was a little bendy, so I super glued plastic styrene to the back. The overlapping shoulder pieces were made the same way. Silver Sharpies are great on dark color craft foam to mark where you’re going to add Barge. I made the belt from 3mm foam and the hip armor out of 6mm foam and sanded the edges. I hot glued the belt to nylon webbing, which acts as my real belt. 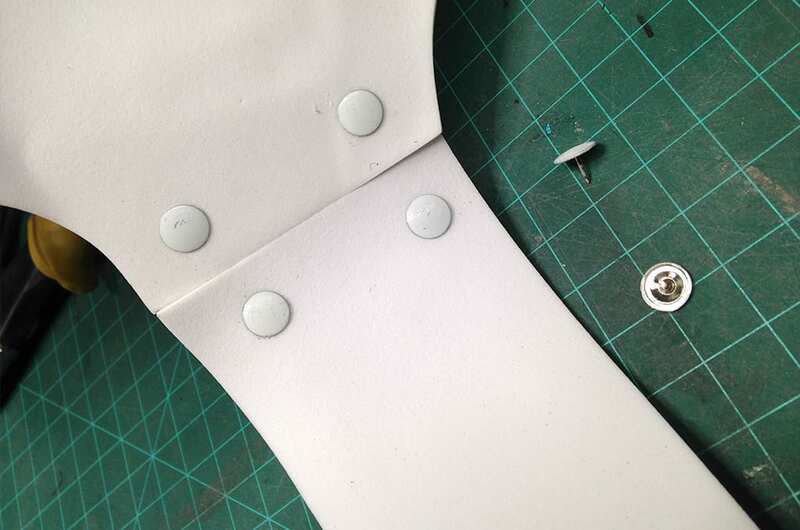 The back of the belt has a quick-release buckle. I made a back to the belt that works as a cellphone pouch! Sanding blocks stood in for my phone as I glued the two pieces together. 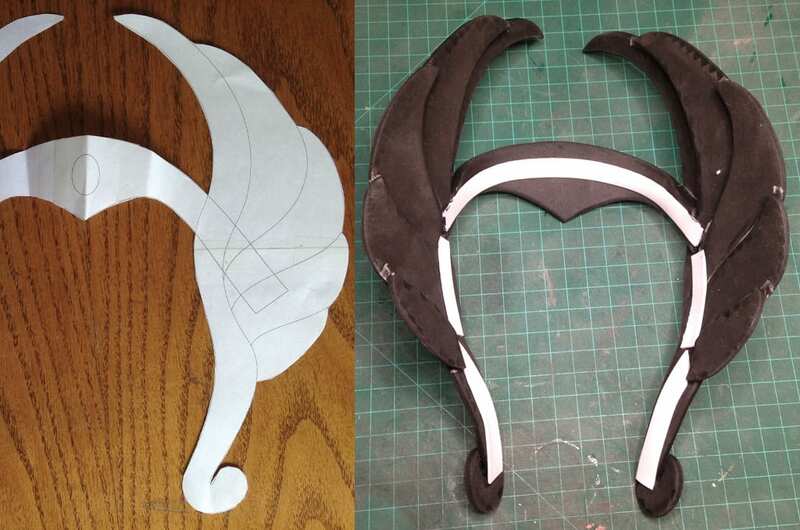 Every piece got heat formed with a heat gun, which also helps prepare the foam for sealing. I wanted to make sure all the armor pieces fit correctly before sealing the foam, so I added the straps and velcro with hot glue. I covered the straps and velcro in masking tape so they wouldn’t get paint on them. 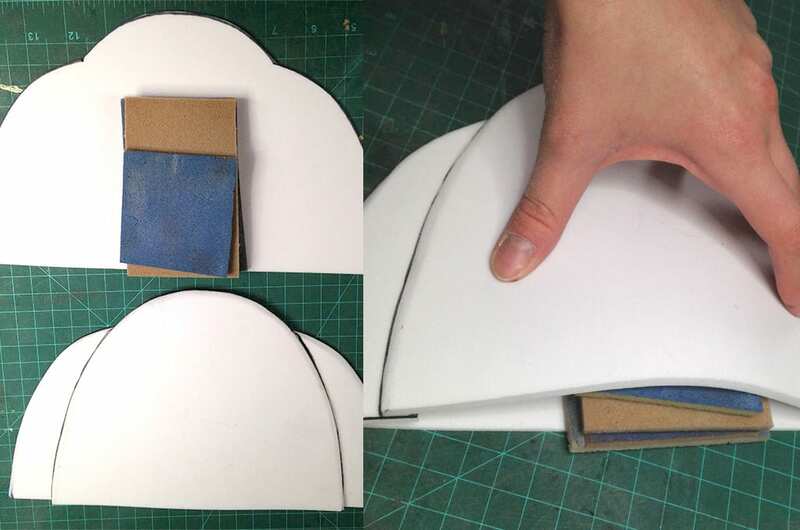 Bill’s Foamsmith eBooks were a huge help with this project. I stitched thread through a few “fake” straps of craft foam. These got hot glued to the hidden nylon webbing structure. For sealing the foam, I ordered White Plasti Dip and Vintage Gold Metallic Plasti Dip. The white costs less, so I gave all my armor pieces four coats of white Plasti Dip, which used four cans. Then the metallic pieces got two coats of Antique Gold and the white pieces got two more layers of white Plasti Dip. I masked off the chest emblem and belt before spraying two layers of the Antique Gold. Peeling off the masking tape was a bit annoying. The antique Gold rubber wanted to peel off with the overlap on the tape, so I used an X-Acto knife to cut away the rubber. I liked the colors and textures of the Plasti Dip, so I didn’t add any base paint and went straight to weathering the edges with grey, brown, and black acrylic. I then put one coat of the clear Plasti Dip Glossifier to protect the acrylic paint and make the armor a little more shiny! I purchased clear gems from Sun and Moon Craft Kits in 30 x 40mm and 18 x 25mm sizes. I painted the backs of the blue gems with acrylic paint. 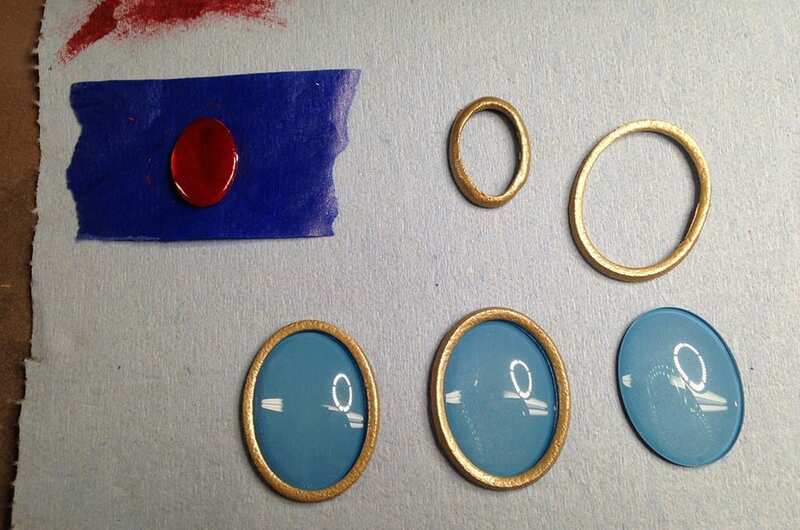 I had a metallic red enamel paint already that I used for the crown gem. When painting, stick a piece of masking tape to the back of the gem to prevent it from rolling around. 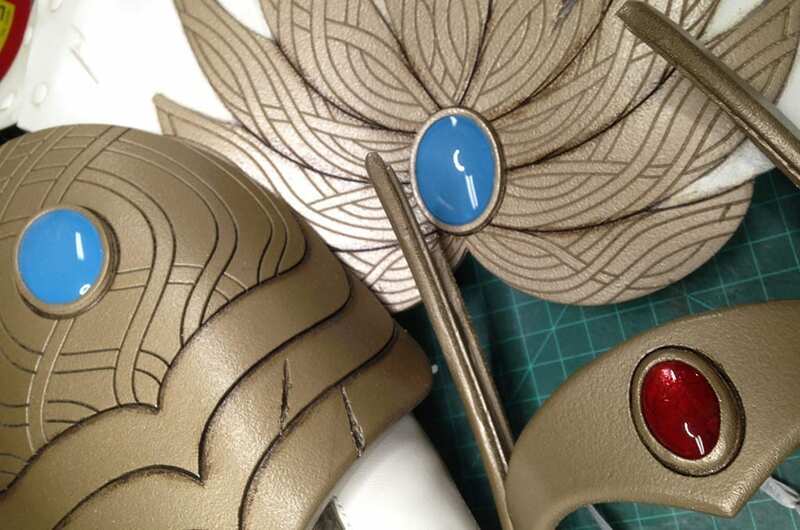 The gem’s rings are laser cut (yay!) 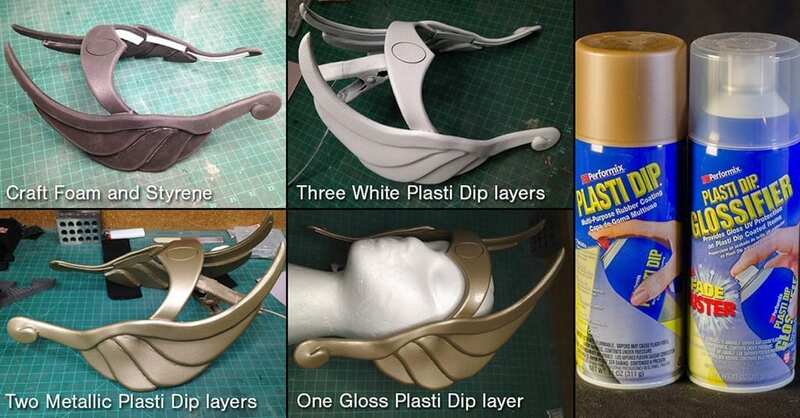 craft foam and coated in Plasti Dip. I cut away the PlastiDip to expose the foam on the places I planned on attaching the gems. I used Barge to glue the foam rings and gems in place. WARNING: Barge worked great with the acrylic painted gems, but did NOT like the red enamel–the paint wrinkled and turned to goo. Moral of the story is, don’t use Barge on enamel paint, which I believe includes some nail polish. I looked around online for affordable gold or white tall boots. I figured whatever I found, I would work into my design. 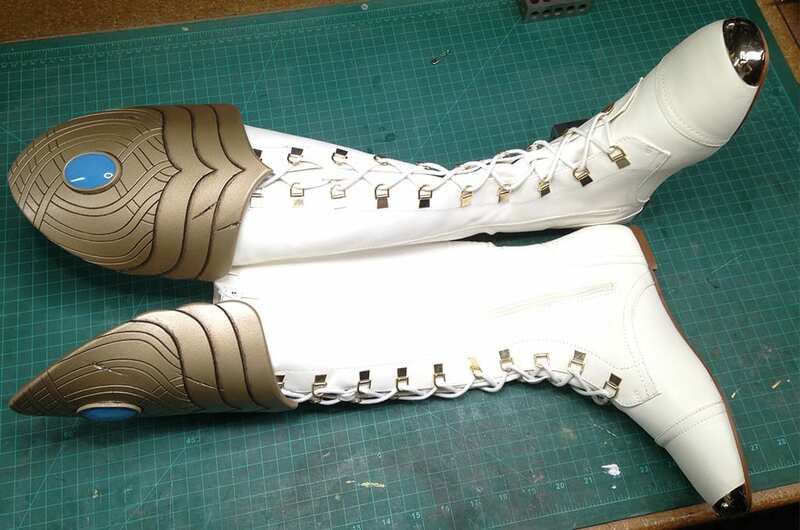 I purchased these nifty White Boots with Metallic Gold toes and they’re actually pretty comfortable. I have gel insoles that I put in my shoes for costumes, which are definitely necessary for these thin-soled boots. 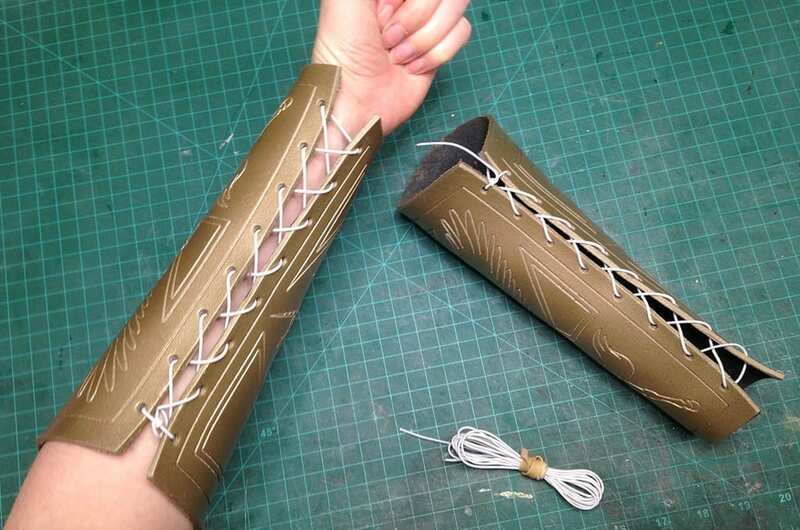 I laced up the bracers with 1/16″ elastic string. 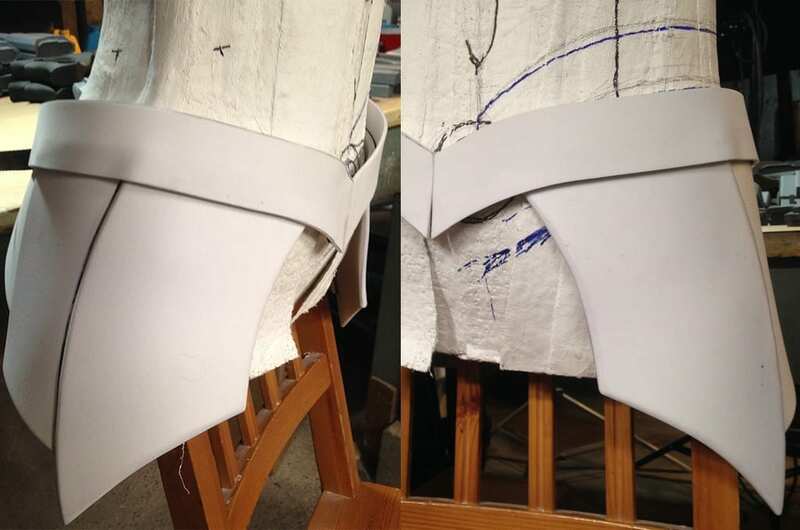 This way, I can slide the bracers on and off without untying them! 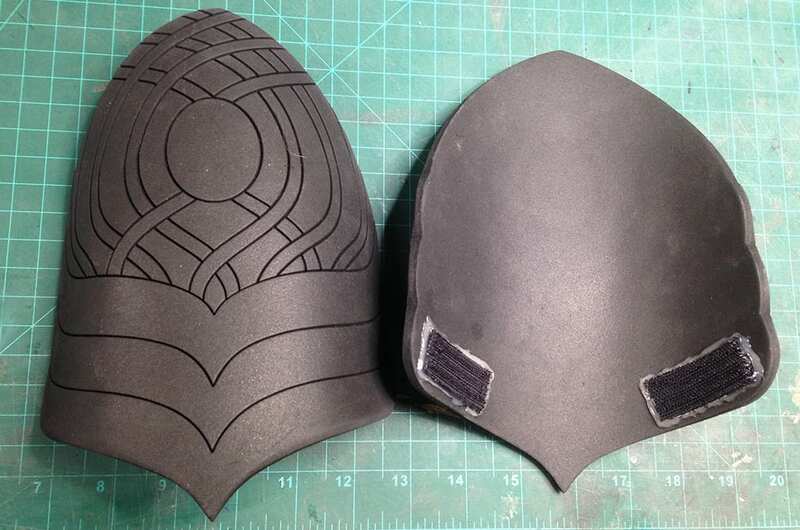 The Plasti Dip coating on the bracers and the fabric I glued to the inside make the holes pretty sturdy–the elastic doesn’t want to tear through the foam. The elastic lacing didn’t stay uniform after wearing the bracers at the convention all day. The elastic slack moved toward the wrist, opening it too far and causing the bracer to twist around my arm. I may try tacking down the lacing with glue to prevent this from happening. I have some leftover chainmail links from our Skyrim Draugr build that I purchased from The Ring Lord. Of course, this means I have to add the extra to my She-Ra costume! 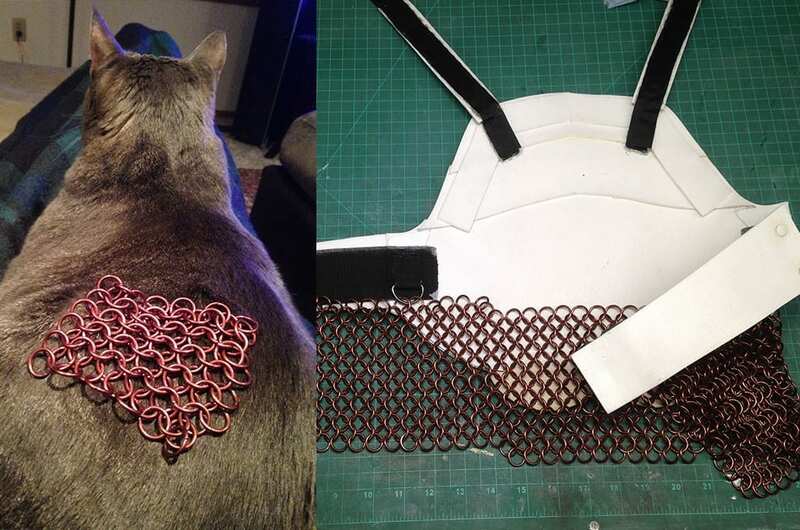 Don’t be afraid to try making chainmail–It’s like knitting and is entertaining to do while watching Netflix. The cape is made from a thin knit fabric that feels like a superhero cape. I’m not experienced with sewing patterns, so I just hemmed a square and bunched the shoulder fabric through two metal rings. I cut off the extra fabric that pulled through the rings and hand stitched the rings in place. I like the look–it reminds me of the newer superman capes that have extra folds of material on the upper back. The white undersuit is dancewear that was purchased for an older costume and never got used. Yay for using old costume pieces! Bill and I got two resin He-Man sword kits from JL Customs and they’re super clean! The kit came with a resin cast gem for the She-Ra sword, but I wanted the gem to match my armor, so we used more 30 x 40mm clear gems. I would have loved to use a slightly bigger size, but the larger gems are not as oblong in dimension. Bill helped me cut out the recess for the gems and we we sanded and glued acrylic rings to the sword. Bill used his leatherworking skills to make a wrap for the hilt! 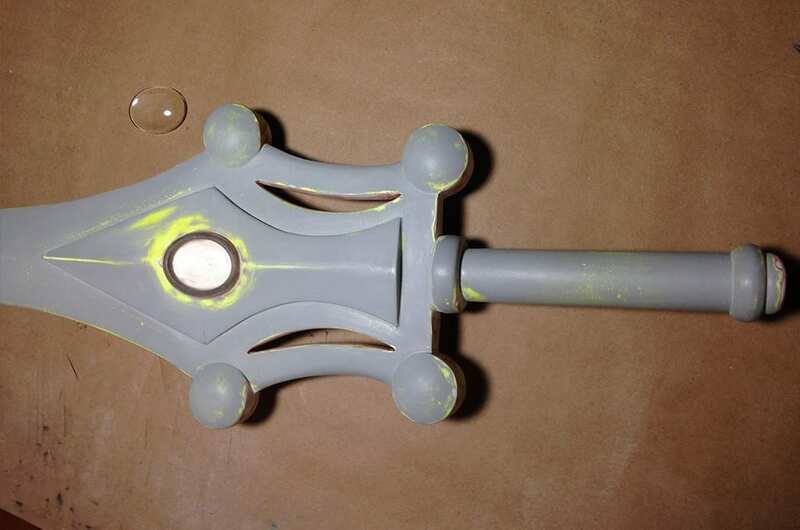 The sword painting ended up getting a bit messed up (didn’t let the clear coat dry long enough), so this will probably get re-painted after the Emerald City con damage. That’s the whole build! I’m sure I’ll make some modifications after wearing it at the convention all day, plus I still have extra chainmail. 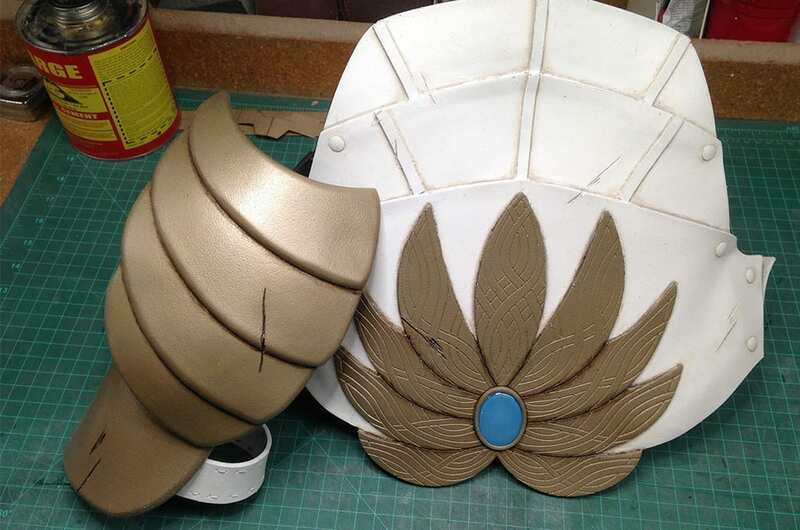 But for now, battle armor She-Ra is done! Thanks for reading!